It was only 16 years ago when Mercedes-Benz introduced the A-Class as its entry-level range. Back then, it was unique with its minivan-esque one-box construction, which catered to small families shopping for a commuter car to drive around town. While it stood out among its peers with its unconventional micro-hatch design, it was also famous, in its first iteration, for failing the Swedish moose test. Three generations later, we now have a proper and planted A-Class hot hatch that is a complete rework of not only the design of the car but its purpose as well. The 2013 A-Class is CATS Motors\' and Mercedes-Benz\'s latest product launch in the Philippines. This is the first time the Mercedes-Benz distributor is bringing in the nameplate to our shores, and just to make a statement, the new A-Class will initially be available in A250 Sport trim. Obviously targeting a younger audience, the premium marque is hoping to add a more dynamic and active demographic to its market portfolio with the stylish and flashy hatch. Based on the Concept A-Class displayed at the 2011 Shanghai Auto Show, the 2013 production version varies only in small details such as the lights, bumpers and mirrors. Mercedes-Benz management sees the now two-box A-Class as its new design direction for the model. Clearly going toe-to-toe with BMW\'s 1-Series and Audi\'s A3, the new A-Class is the brand\'s entry-level offering. Browsing through its spec sheet, however, \"entry-level\" with the A-Class and more so with the A250 Sport doesn\'t necessarily equate with cheap or underwhelming. Aside from its new looks underpinned by a sturdy chassis, the five-seat, front-wheel-drive A-Class showcases a rich features list that one would expect from a premium brand. Like its more illustrious stablemates, the A-Class sports Mercedes-Benz\'s Direct Steer system for snappy yet loaded steering; an Eco start/stop function to save fuel in stop-and-go traffic; an electric parking brake that disengages when driving out; tire pressure monitors; cruise control; and an Active Bonnet pedestrian protection design. Driver aids such as acceleration skid control, hill-start assist, brake assist and electronic stability program are also standard. Underneath the hood is a potent 2.0-liter, turbocharged gasoline engine that pumps out 211hp and 350Nm of twist from as low as 1,200rpm. Matched with the 7G-DCT seven-speed dual-clutch automatic transmission and a short-throw lowered sport suspension that is just as at home on a racetrack as it is on winding mountain roads, the A-Class in A250 Sport guise justifies its name with a well-padded list of spirited driving essentials. 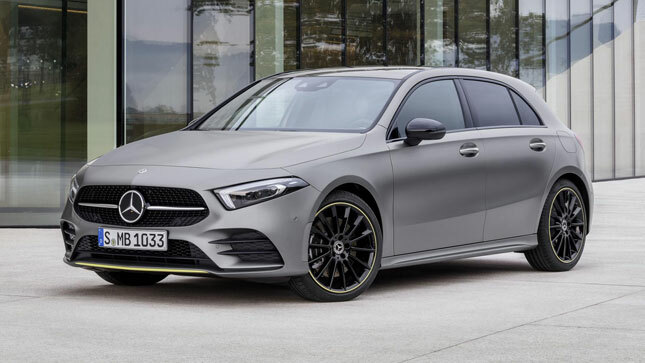 And just to drive home the point, Mercedes-Benz loaded the A250 Sport with AMG performance and styling cues earning this variant its \"Engineered by AMG\" tag in other markets. On the outside, an original wraparound AMG bodykit, AMG 18-inch light-alloy wheels, shiny diamond grille-work, polished stainless steel twin-pipe exhaust system with oval tailpipes, cross-drilled front brake rotors, Mercedes-Benz branded front brake calipers, and a red accent on the front lip distinguish this from a run-of-the-mill A-Class. Inside, sport bucket seats upholstered in Artico leather and Dinamica microfiber with red stitching; a nappa leather-clad sports steering wheel with red topstitching and a flattened lower section; an instrument cluster in checkered flag motif; carbon fiber-look dash trimmings; red seatbelt harnesses; and sport pedals are just some of the items from Mercedes-Benz\'s in-house racing tuners. Of course, safety continues to be one of the German brand\'s main priorities as it equips the A250 Sport with knee and window airbags aside from the usual dashboard complement, adaptive flashing brake lights, and Attention Assist that detects driver drowsiness and warns of micro sleep on the basis of steering behavior. CATS Motors launches the A250 Sport with a price tag of P2.58 million, which is a steal really, considering this Mercedes-Benz actually looks, sounds and behaves like a true sports car. With the A250 Sport, you can now take to the track in style.